We now have a better picture than ever of what the incredible landscapes of Saturn's moon Titan look like. On the wet north pole of the moon, there are many enormous lakes — and newly-analyzed images from Cassini spacecraft reveal that they're surrounded by dramatic salt flats. 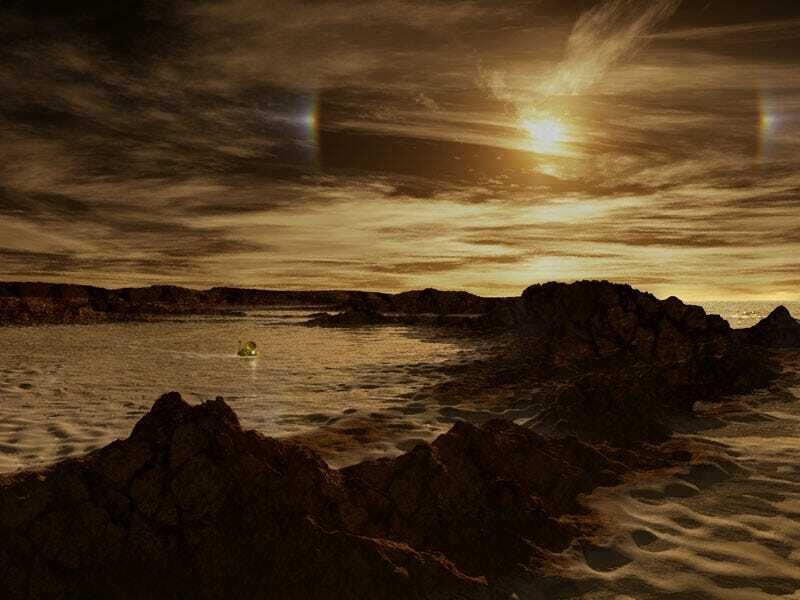 NASA's Cassini spacecraft found the salt flats by detecting differences in the composition of surface materials around polar lakes on Titan, Saturn's largest moon. Although its lakes are made of liquid ethane and methane rather than liquid water, Titan is the only place other than Earth in the solar system that we know has stable liquid on its surface. With the exception of one large lake and a few smaller ones near Titan's south pole, almost all of Titan's lakes are near the moon's north pole. In the upper right of the mosaic is Kraken Mare, Titan's largest sea, covers about the same area as Earth's Caspian Sea and Lake Superior combined. The dark area above and to the left of Kraken is Ligeia Mare, the second largest sea. Below Ligeia is Punga Mare, the third Titanian Sea. Numerous other smaller lakes dot the area. Titan's north pole is located just above the end of the "finger" of Punga Mare. The resolution varies across the mosaic, which was created from a number of separate images, depending on when each cube of data was acquired, but the best surface sampling is as small as 2 miles (3 kilometers) per pixel.